More Than Meets the Eye – A Patchwork Family Novel - by Karen Witemeyer Pecan Gap, TX 1894 Three unlikely and unrelated orphans have banded together to scratch their way into a respectable life and makeshift family under the name of Hamilton. Zach is the brisk older brother who does whatever it takes to provide for the family he never asked for. Seth is a suffering asthmatic with excellent business skills and Evangeline is an innocent young woman who refuses to let her heterochromia (two mismatched eyes) define her character, despite the ignorance and lack of compassion from the locals. Each one passionately and fiercely loves the others and will care for them come hell or high water. Logan Fowler has secretly returned to Pecan Gap, looking for justice for his family who was abruptly forced from their home when he was a teen. He is camping out on the edge of the Hamilton’s ranch when he unexpectedly observes Evangeline about to be attacked by a wild boar and his moral compass just can’t let that happen. Circumstances twist and turn and danger arrives unexpectedly when Logan and Evangeline observe someone throwing something into the river which forces these people to work together. Tough turnips was a phrase I had never heard that made me laugh. I might have to steal that one! CH.15: “People might try to hide their broken places and to be whole, but the truth is that we all have failings. That is why we need each other.” I really enjoyed this story and discovering the onion layers being peeled back from each character. The danger element elevated the tale, and the faith-filled moments were touching as well. Evangeline was so special and really brought joy and hope to everyone. I highly recommend this 5-star story and look forward to the next one. Thank you to Bethany House Publishing who sent me a review copy. My opinion is my own without expectation or compensation. I love spunky heroines who are vulnerable yet love fiercely! 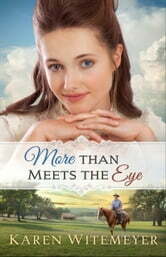 Such is the case of Evangeline Hamilton who is the heroine in "More Than Meets The Eye". I find it fascinating that she possesses mismatched eyes - one bright blue and one dark brown. I'd never heard of such a thing! Evie loves her 2 brothers fiercely. They were orphaned young so they have a very tight bond. I was blown away by how they managed to make it and thrive. Evie is such a ray of sunshine even though she has never been treated very nicely, except by her brothers (because of those eyes!). It made me stop and think about how it's just the same in today's world - bullies and others who don't treat others nicely. Evie rises above that! She's not quite sure what to do when she meets Logan Fowler in the woods behind her house! He's a mysterious stranger! Evie has been sheltered most of her life by her brothers so men haven't really been part of her life but she feels something for Logan and she also feels he is in need of her cheerfulness which he doesn't necessarily appreciate at the beginning! I really enjoyed their interactions! Logan is looking for the man who is responsible for his father's death and he wants justice! He doesn't want to deal with a "Mary Sunshine"!!! But Evie grows on him! I loved the secondary story going on in the book too about a new character, a crime being committed and how everyone gets involved to solve it! This book is just SO good! I had a very hard time putting it down and when I finished it, I wanted there to be more chapters! I wasn't ready to let go of the characters! Ms. Witemeyer's books continue to get better and better! I've read every one of them and her characters come alive to me! I definitely recommend this book as one that will capture the interest of the reader and keep it all through the book! *I received a copy of this book from the publisher. I was under no obligation to provide a review. All opinions are my own. An exciting adventure from a well-beloved author! The prologue for this book is powerful. Had me tearing up within the first few minutes of opening the cover. From that point on, you have to know what will happen to the orphan characters, because you've become connected to them on a heart level, every single one. Logan and Eva are both beautifully flawed characters, and their journey is a delight to read. From the heroine's unique family and newfound friends to a horse and pet pig named after Old Testament prophets (one of which wears a red bow to avoid becoming ham steaks), the secondary characters display show-stealer potential. Their plot weaves in and out with the main characters' goals so well. I have a hunch we'll be seeing Zach's story soon, and the anticipation is getting to me already. The jaded son of a riverboat gambler who gave up his dreams to raise two orphans? I have a feeling his story is going to be well worth the wait. I was delighted to see a dual romance thread in this book. Smart, protective men and strong-but-feminine women shine through all the ups and downs of finding love in tough circumstances. The nerd in me loved to see a bookish romance between secondary characters, while the western-loving part of me smiled at the roguish antics of the tough and gruff leading man with his Lady Sunshine. One aspect that sets apart the main romantic story, is the hero's "wooing" the heroine to get information from her that will advance his goals, which of course accidentally turns into a real courtship, leaving our hero with lots of well-deserved inner conflict! I enjoyed watching him squirm under the glaring light of his conscience while wrestling between serving up justice and admitting his heart had found its home with a plucky little farm-girl sporting mismatched eyes. Overall, this story delighted me with surprises and fueled my curiosity for the next book in the series. There were only a couple times I didn't quite understand the hero's decisions in relation to the villain, but the resulting danger and edge-of-your-seat moments saw me turning pages faster to keep up with the action! The author's trademark wit, adventure, and warm western charm saturates this story. I would recommend this book to anyone who enjoys inspirational western romance with a giggle. *I received a copy of this book from the publisher free of charge. My review is voluntary, and the opinions expressed are my own.